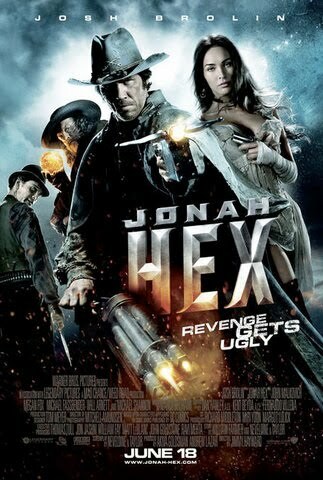 This is the tag line of Jonah Hex as per the movie poster released yesterday. If Michael Fassbender wasn't in Jonah Hex, I would pass on it, but I'm obligated to watch it because he's in it. And I will watch it when it comes out on it's first weekend. I just don't think it will be a blockbuster, or even fare well with critics, but, it'll be summertime and Fassy as a nasty guy would be fun to watch. In other Fassbender movie news, it appears that he will start filming A Dangerous Method, formerly known as The Talking Cure in May in Germany. This shuffles things around a bit as I thought after filming Jane Eyre, he was going to Canada to film A Single Shot, so I don't know what's going on with that. But seeing that a Cronenberg film of this caliber not only changing its name but shifting filming schedules, that may mean that either 'Shot' has been delayed for later in the year, or Michael has removed himself from the production. I'll research this a bit more and write about it later. Fassbender, meanwhile, brings Quintus essential poise and flinty purpose. It’s going too far to say this role could do for him what Maximus did for Russell Crowe but, if nothing else, Centurion should prove to those who put up tentpoles that Fassbender certainly has what it takes to lead a major action picture. That's cool, I was hoping this film would do this for him. So when Centurion opens in the states in May, I'm now thinking that there may not be a special premiere for it in the states and we'll just have to dutifully go to the theaters and see the film and be as supportive for Michael and the film as best we can as the events of the past 5 weeks have proven that Fassinator's thoughts and opinions are being read by the media and industry backers of Mr. Fassbender. I have only seen one still from Jane Eyre and it was of Mia. It looked beautiful, but naturally I'm just waiting for the first glimpse of Michael as Mr. Rochester. There has been not one word from Michael or a picture of him in recent weeks, and I just hope that he's doing well emotionally and mentally and when we do see him, he will be in good spirits and just being busy with his career. Like the liner note for Jonah Hex, revenge does get ugly, but the best type of revenge is served cold on a dish and carrying on as if nothing happened. Dangerous method starts shooting in the middle of May, right after Jane Eyre. I'm in Germany while they're shooting! Do you know where in the country they're filming? Also, I couldn't help but feel proud that Michael was on the Jonah Hex poster. I think this might be his first time on a poster in the USA so I've decided to turn that into a huge accomplishment. You know what would be awesome? If Michael got to do the talk-show circuit for Jonah Hex. Even if it was just one interview with Jimmy Kimmel or something I'd probably die. Thanks Maura. I did read that article last week and it made me wonder when he did that interview as I don't believe he has spoken to the media since before early March. Can't wait to read his next full blow interview, it should be interesting.